Candid commentary on life and beauty by two Aussie twenty-somethings. After four years of on-again-off-again, full time/part time study, I will finally complete my Bachelor of Business at approximately 7:30PM on Friday the 18th of November, 2011. Can I get a hoo-frickin'-rah?!. Anyway, I only have one exam remaining so I figure that now is the perfect time to procrastinate. 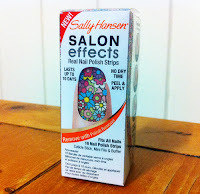 So..
A couple of months ago, I decided to spoil myself by purchasing the Sally Hansen Salon Effects Real Nail Polish Strips (I think it was around $15 AUD). 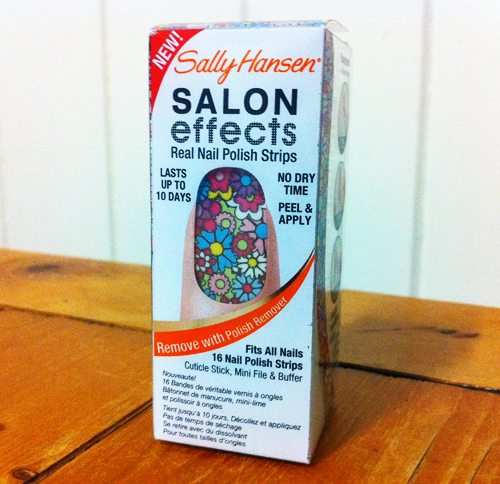 Essentially, this product promises bright, patterned and long wearing nail colour without the hassle of drying time. 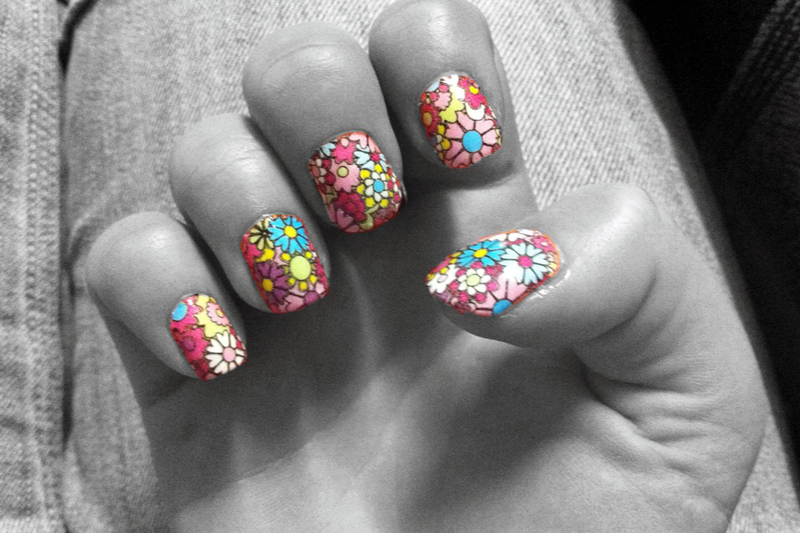 The product is available in 24 colours/patterns but my favourite is definitely 'Girl Flower'. 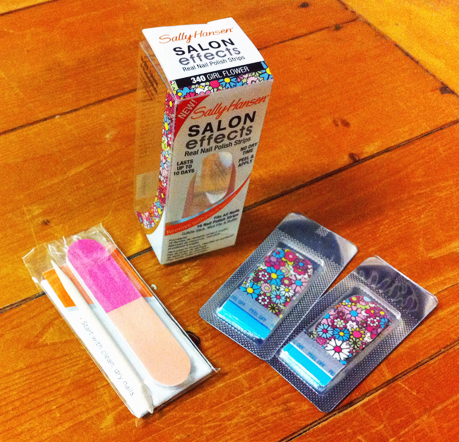 ﻿Inside the package you will find 1 x small nail buffer, 1 x cuticle stick and 16 x tacky nail polish strips in varying sizes. To prep for application, all you need to do is clean, dry, buff and shape your natural nails, remembering to push back those unsightly cuticles lol. ﻿﻿To apply the nail strips, you need to carefully size them up against your nail bed. Once you've made your selection, peel off the the backing strip and apply the polish to your nail by starting at the cuticle and smoothing it downward. Press and hold for a few seconds to ensure its longevity. To finish, use the nail buffer to remove any over hang. This is going to be a little hard to explain but personally, I found it quicker to wrap the excess underneath my nail and hold it with my thumb (same hand). Then I just used my thumb nail from the opposite hand to push underneath nail to cut through the excess. I found that this cut the strip almost perfectly. Before you rush out to purchase, I think it's important to advise that applying this product is trickier and more time consuming than it seems. From memory, it took me well over half an hour and I was left sitting in a pile of messy nail polish clippings. Hmm.. Perhaps I'm just a little OCD. Anyway, if you can get over that issue it's a pretty neat little product. As you can see in the picture, you end up with a great result. I loved my funky digits and best of all, they lasted around two weeks. Win! P.S. Good luck to anyone else with exams! As I'm sure you're all aware, Beauty Heaven and Nivea recently teamed up to offer us the chance to win one hellova 'holy sheizer!' German experience. All you needed to do was film yourself reviewing your favourite Nivea product. Anyway, here's our review for Nivea Visage Gentle Facial Cleansing Wipes - attempt number 256. We had a little giggle after watching this vid and we sure hope you do too! P.S. this was filmed VERY late at night lol! Ooh Baby! It's Maybelline Baby Lips! SoMAKEUPurMind © 2011. All Rights Reserved. Powered by Blogger.